It is no secret that the commercial Massive Open Online Courses (MOOCs) launched by Coursera, Udacity, and edX in 2011/12 are a different beast from the majority of for-credit online education offerings. One such difference is the pattern of quick drop-off of students within each course, particularly in the first 2 - 3 weeks, which we documented in 2013. We also know that the original disruption vision for these large MOOCs has not come to pass, with many MOOC providers moving into Online Program Management (OPM) business models and shutting off many of the free and open access that made MOOCs in the first place. Late last week two researchers at MIT, Justin Reich and José A. Ruipérez-Valiente, published an article in Science titled "The MOOC Pivot" that provides new multi-year insight into the trends based on edX usage at MIT and Harvard, the two founding schools for edX. 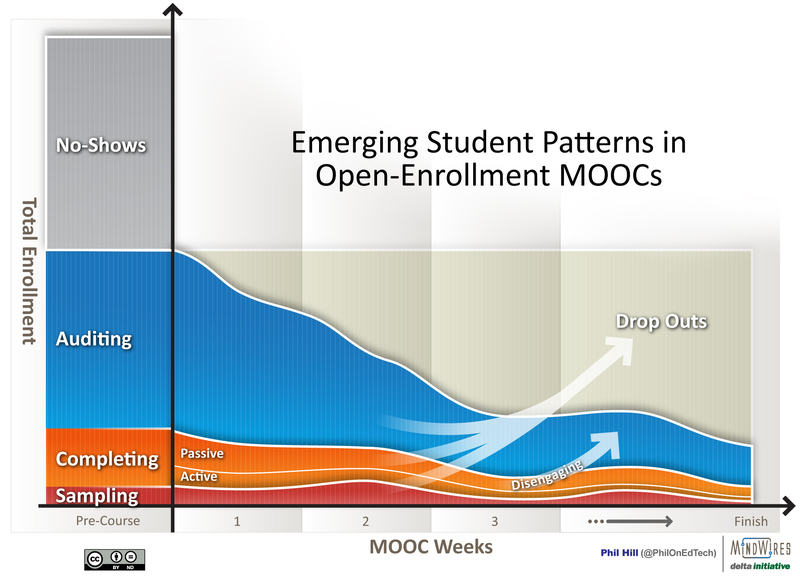 In a nutshell, MOOC activity peaked in 2016 based on new individual learners, based on a dataset of "565 course iterations from 261 different courses, with a combined 12.67 million course registrations from 5.63 million learners", leading the MOOC providers to look to the OPM market as a more-realistic method of sustainability. The researchers identify three insights from their data [emphasis added]. To better understand the reasons for this shift, we highlight three patterns emerging from data on MOOCs provided by Harvard University and Massachusetts Institute of Technology (MIT) via the edX platform: The vast majority of MOOC learners never return after their first year, the growth in MOOC participation has been concentrated almost entirely in the world's most affluent countries, and the bane of MOOCs—low completion rates—has not improved over 6 years. The highlighted conclusion makes sense, but to my knowledge we have previously not had any solid data to back this point up. 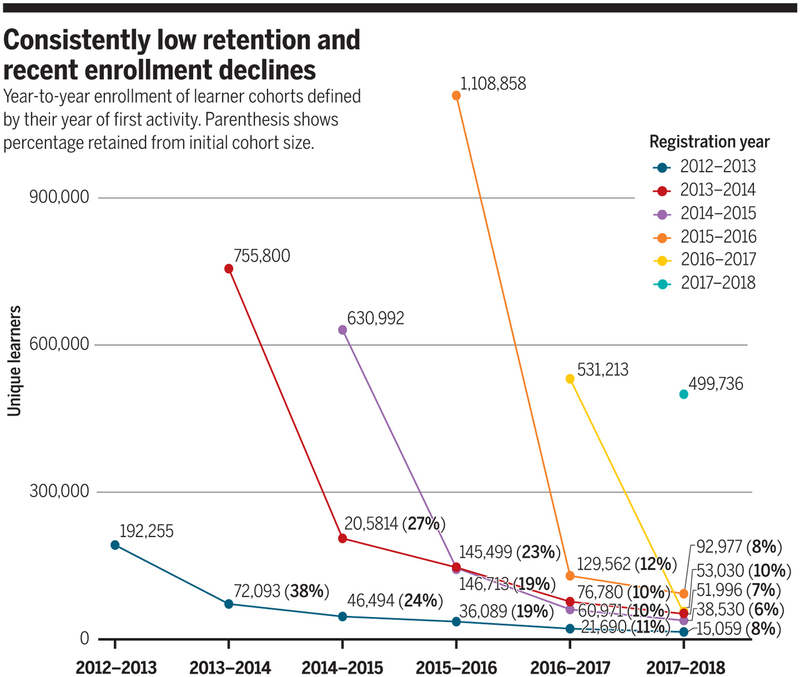 The following chart in the article shows annual cohorts of learners and tracks them over time, showing that the decrease per year largely mirrors the course-level situation. 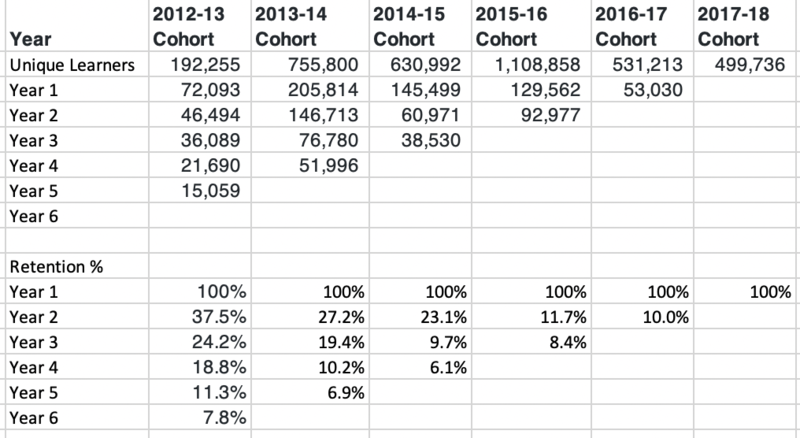 Thus 38% of 2012-13 cohort enrolled in at least one course in year 2, and 24% of 2012-13 cohort enrolled in any course in year 3, etc. Over time, these year 2 / year 3 / year 4 retention numbers reduce significantly. Thankfully, Justin and José provided a GitHub repository of the data, and perhaps a transposition of Table S1 can make these trends more obvious. It took nearly six years for 10% or fewer of the 2012-13 cohort to remain active (enrolled in any courses), but just two years for 2016-17. And note that the cohort size has been dropping since 2015-16. Keep in mind that the MOOC providers counteract these institution-level trends by increasing the number of institutions that they partner with over time. There is more analysis in the full article at Science - it's worth reading the whole thing. I just jolned to collect the modules, texts, mp3s etc., (i.e.) mass downloading) for a later read. Participation wasn’t required or necessary. It is as if I had got a book from Scribd or LibGen. And no one would recognze completion of such a course, it one were using it to enter a school on a different, higher level. It’s just like University of the Air/Open University, thought the latter had an academic track about it.